KIEV, Ukraine -- Though few would dispute that the Eurovision Song Contest is one of the continent's most politically charged annual events, actually singing about politics is verboten. Crimean Tatar singer Susana Jamaladinova, known as Jamala, says Russia has overreacted to her song. But this year's submission from Ukraine is causing more controversy than usual ahead of this month's contest. Russia feels the song by the Crimean Tatar Jamala is a swipe at President Vladimir Putin, who annexed Crimea from Ukraine in 2014. The singer denies the allegations. The title of the song, 1944, certainly reopens old wounds. It is the year in which thousands of Crimean Tatars were deported to Central Asia during the reign of Soviet leader Joseph Stalin. They were allowed to return to their homeland only decades later. In her song, which she wrote herself, Jamala tells the story of her great-grandmother, in English and her indigenous language, though neither Stalin nor the Crimean Tatars are explicitly mentioned. Only her lyrics about not having a home and being robbed of peace could potentially be interpreted as referring to the fate of her people. She might deny the song is political, but some of her public utterances definitely have been. 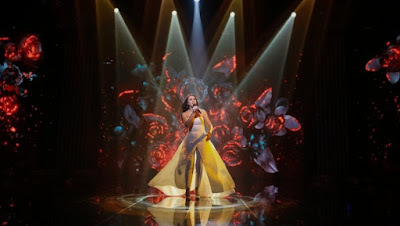 "Crimean Tatars once again live in an occupied territory, which is not easy for them," Jamala told Ukrainian television station NTU when she was nominated as the country's Eurovision entry. Many Crimean Tatars protested against the annexation of Ukraine's southern Crimea region by Russia, and since then, dozens of activists have been arrested and threatened, newspapers and TV channels have been banned, and many families have fled to Kiev and elsewhere. Jamala's family remains in Crimea, though she has not seen her relatives in more than two years. Many Russians are angered by the song, and not only because they see it as a reference to a dark chapter in Soviet history. Russian politicians argue it is a clear allusion to the recent developments in Crimea. Russian lawmaker Robert Schlegel remarked that if Ukraine wants to submit a song about political issues to the European Song Contest, maybe it should focus instead on its own problems. "A song about corruption or political oppression in Kiev could also be successful," he said. For her part, the singer has taken the negative reaction from Russia in her stride. The comments have helped her attract interest from around the world before the competition has even kicked off. "If they had reacted calmly, probably no one would have given the song a second thought," Jamala told the Ukrainian newspaper KP. The song simply reminisces about 1944 in Central Asia, she said. "Every time we sat down at the table, grandfather would recall the deportation, telling us how they had no bread," she told the website OpenRussia. The European Song Contest jury agrees with Jamala. The 32-year-old can compete in Stockholm later this month as planned - neither the song's title nor text is political, the European Broadcast Union (EBU) in Geneva has decreed. The jury has strict rules that it follows, and countries are seldom allowed to take the stage with obviously pointed messages. In 2009, Georgia's nominee created an uproar with the song We don't wanna Put in, an obvious criticism of Putin's politics a year after the country's war with Russia. The jury rejected the submission after the Georgians refused to tone down lyrics that had infuriated Russia, which was also the host country that year. As the contest nears, Jamala has said she is uncomfortable with the roles that have been thrust upon her, wanting to be seen neither as a heroine for Ukraine, nor as an enemy of Russia. "Too much has been placed on me: Crimea, Crimean Tatar," she said.